Land of Sky is located at 339 New Leicester Hwy, Suite 140 in Asheville NC. Our office is located 2 miles down New Leceister in the Leceister Crossing center. Click here for directions and map. JobLink Career Centers are located in Asheville, Flat Rock, Hendersonville, Marshall and Brevard. Click here for contact information. Does my city, town, or county belong to the LOS? Land of Sky is one of the largest regional councils in NC serving 71 member governments. Click here to view a listing of our members. Who administers or oversees the LOS? Land of Sky acts as a division of local government and is governed by a Council and an Executive Committee. The Council sets policy and appoints the Executive Director who manages the affairs of LOS. There are 50 members of the LOS Council. The Executive Committee is composed of seven members; one member from each member county and three members from municipalities. The Executive Committee is authorized to act for the Council on all matters other than the adoption of the annual budget and the adoption of the annual program of work. How long has the LOS been in existence? The Council began in 1966 as a partnership of five counties, Buncombe, Haywood, Henderson, Madison and Transylvania. Later, Haywood County became part of "Region A", and "Region B" brought the region's municipalities (now numbering 15) into the partnership. The Council and its member governments work with a several federal partner and other agencies to help fund regional hospitals, libraries, community colleges, water and sewer projects, industrial parks and sites, etc. Land of Sky is primarily grant-funded, with additional support from dues from our 19 local governments. With an annual budget of over $16,000,000, we manage over 150 grants, 70% Federal, 16% State and the balance from Local and Private Foundation contracts. Our largest program is the Area Agency on Aging which passes through funds to counties and to non-profits for services to the elderly. LOS receives both state and federal funding for administering workforce development and housing programs. 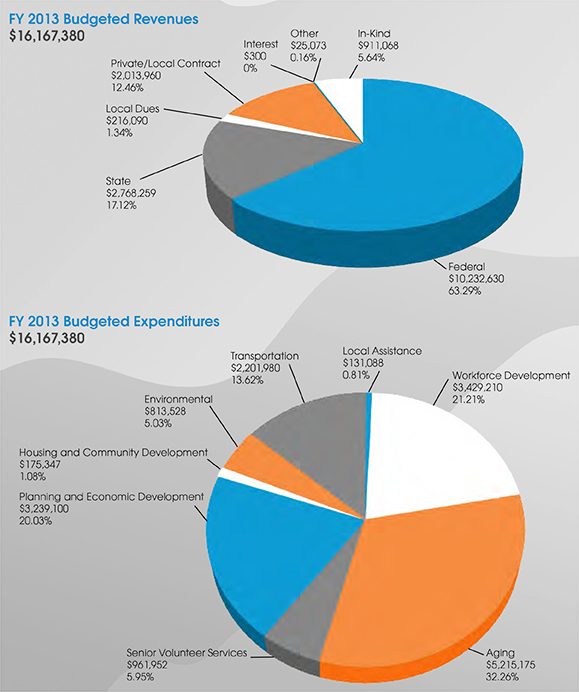 Other state funding, typically in the form of grants, assists with regional planning and water resources programs. Land of Sky serves its members and the citizens of the region by administering programs related to aging, workforce development, volunteer services and economic and community development. LOS is strongly service oriented and our programs are driven by membership needs. LOS employs approximately 64 people. Browse through the website to find out more about LOS programs. We serve NC’s region B – Buncombe, Henderson, Madison and Transylvania counties.